This song was in Simpsons episode “Homer’s Barbershop Quartet”. The episode is one of my favorite because it’s Beatles parody. 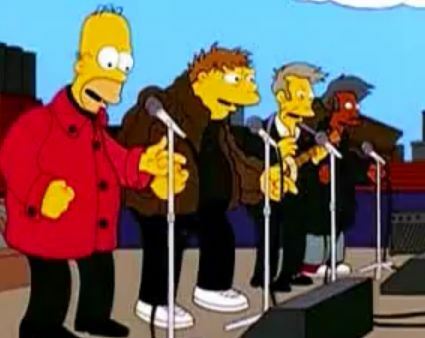 It was sung by BeSharps (Homer, Apu, Barney, Principle Skinner) on the roof top. And now, the lyrics is so relevant with having our twins on board. That sign on my car’s windowpane. ‘Cause I’m drivin’ in the carpool lane. ‘Cause that little yellow sign can’t be ignored. I’m telling you it’s mighty nice. Posted on June 26, 2011 by e2rd_san. This entry was posted in Music & Lyric and tagged song. Bookmark the permalink.